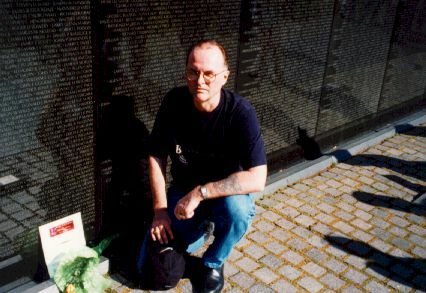 Vic Vilionis leaving our remembrances at The Wall this past April (1998). Vic designed the beautiful logo on Michael's Page. I had so many wonderful pictures of Michael, but they were destroyed by a family member several years after his death. My favorite he sent me from 'Nam just a few weeks before he died. The newspaper published it with his obituary, but I haven't been able to find that copy in a library search. He's kneeling in front of his compound in Da Nang: it's a sunny day, and he's smiling so beautifully and lovingly into the camera. Simply gorgeous. For years I had a little shrine to him in my apartment: that picture framed, along with precious mementos, including our copy of The Prophet -- all water and salt stained. Funny story. We had gone to Galveston for the day and were reading and talking about entries in Gibran's book and our hopes for the future. We left it to take a long walk down the beach; and when we got back, the tide had come in. Not only was all our stuff soaked, but we had to dig the back tires of the car out of the sand. Hilarious--I'm "rocking" the car to Michael's instructions, while he's digging sand. I was afraid I'd back over him. We laughed so hard. And I was horribly sunburned; so when we got back to his apartment that night, he ran me a warm bath, had me soak a while, then rubbed me gently with lotion, and lay next to me all night trying not to touch me while I moaned pitifully, and he told funny stories. We were both 21 when we met, seniors at the University of Houston. He was a philosophy major; and we both wanted to be college teachers, who had our students visiting all the time. We met in The Cougar Den on campus -- we had mutual friends but had never been introduced before that day. He was reading Heinlein's Stranger in a Strange Land, and that's how we started talking. At one point, he went to the juke box and played Spanky and Our Gang's "I'd Like to Get to Know You," came back, sat across from me, and smiled into my eyes. That was it. We spent the rest of the summer together. I knew he was a risk. Michael had dropped a course that wasn't going well, which put him under the limit. At the same time, his draft number came up. Rather than try to get out of it, he opted for volunteering for the Marine Corps -- shorter tour of duty; and he thought he could get back in school sooner and have it paid for so he could go on to graduate school. So, when it started, I knew he would be leaving and that he would go to 'Nam. It was an idyllic summer: I stayed with him: he cooked for me while I studied (interesting: I especially remember his spaghetti); we took long walks (one of them was joined by a puppy that Michael played and played with -- I've never forgotten that); listened to 60s music; Michael painted (he did beautiful water colors) and wrote poetry to me. We had friends over; he was one of the most beloved people I've ever met; others simply adored him. Then, the night before he left for boot camp, he asked me to marry him. In fact, we said our vows before friends; and he addressed all his letters to "Mrs. Michael McAninch." He came home on leave for three weeks at Christmas and wanted to get married then. I said let's wait and do it right with family and everything. Biggest mistake I ever made in my life; but I was worried about his parents, who didn't like me; and I was worried about my own parents, who thought we might be marrying out of "war frenzy." This is why I never interfere with my own son's decisions about his personal life. But, it was a wonderful three weeks. We saw The Yellow Submarine and Romeo and Juliet, hung out with friends, and had the best New Year's Eve of my life, even to this day. He called me from San Diego the night before he left for Viet Nam. I never heard his voice again, but he wrote two and three letters every week from 'Nam. In May, he became ill with malaria and ended up in a hospital. I still believe they should have sent him home. But they returned him to his squad. I don't know how he remained so upbeat and positive in all his letters: he was in some of the worst battles of the war that summer. My job was to keep writing, sending pictures and care packages, and depositing the checks he sent home for our marriage and apartment upon his return. Never once did Michael ever complain. 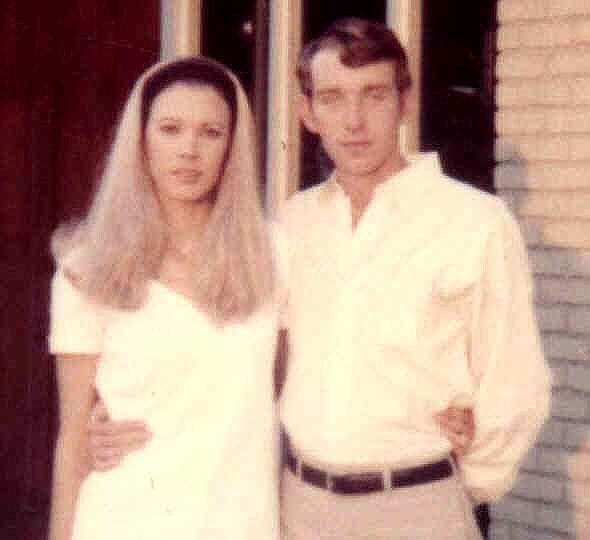 At 9:00 a.m. on August 28th, 1969, near Da Nang, his platoon came under mortar fire. He was the squad leader and got all his men to safety in time -- all but one. One young man was hit in the open before he could reach cover and was calling for help. Michael went back for him. As he was pulling the wounded man into the cover, they were both killed by a mortar. I buried him on September 9th, the day we were supposed to meet on his R&R and six months before he was supposed to come home. He was twenty-two. Michael was awarded the RVN Cross of Galantry with Palm and the Purple Heart (posthumously) for his actions that day in one of the worst battles of the Summer Offensive at Hiep Duc Valley. And, he left me his life insurance so I could go on to graduate school. Though I remarried (I always have considered myself Michael's wife) and had a family, I never forgot my Michael nor did I ever stop loving him. Thank you, Jim, for honoring him and his fallen comrades in this way. The database Page for Michael Alan McAninch.